Download Bike Registry Form here! Bike theft is one of the most common property crimes in our community. It’s frustrating for riders who often stand to lose hundreds or even thousands of dollars’ worth of their property. And, in communities as bike-friendly as Victoria and Esquimalt, the theft of someone’s bike is often the theft of that person’s prime mode of transportation. 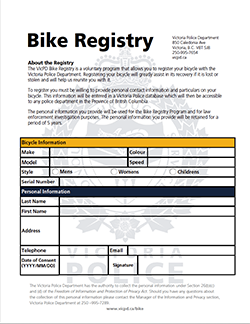 That’s why we launched the new VicPD Bike Registry to help combat bike theft in the capital region – and why hundreds of bikes have been registered since the registry was launched in July 2015. The VicPD Bike Registry helps officers reunite found or seized bikes with their rightful owners. For example, from January to June 2015, we received 335 reports of stolen bikes and have, so far, returned 120 of them to their rightful owners. We’ve also found 180 bikes that were not reported missing to us. Of these, we’ve been able to return about a quarter of them. Registering your bike takes a couple of minutes and must be done in person. You simply fill out the form with your contact information, bike serial number and description. You can fill out the form at community events or at VicPD Headquarters at 850 Caledonia Ave or the Esquimalt Public Safety Building. Once your bike is registered, officers will be able to gather all the particulars of your bike when we recover it, and get it back to you. By registering your bike, you also make it much easier for officers to establish that it is stolen when checking a person riding it without your permission. This will help streamline the process and will help us get your bike back to you so you can get riding again.